Abstract Administration of p.r.n. (pro re nata) medication is a typical practice in acute inpatient mental health units. Although guided by the prescription, the administration of p.r.n. medication is a relatively autonomous component of the nurse’s role, and the decision to administer is generally one for the nurse. 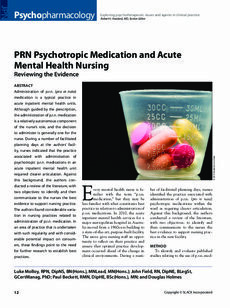 During a number of facilitated planning days at the authors’ facility, nurses indicated that the practice associated with administration of psychotropic p.r.n. medications in an acute inpatient mental health unit required clearer articulation. Against this background, the authors conducted a review of the literature, with two objectives: to identify and then communicate to the nurses the best evidence to support nursing practice. The authors found considerable variation in nursing practices related to administration of p.r.n. medication. In an area of practice that is undertaken with such regularity and with considerable potential impact on consumers, these findings point to the need for further research to establish best practices. Mr. Molloy is Senior Lecturer, University of Tasmania, Sydney, New South Wales, Dr. Field is Associate Professor, University of Tasmania, Hobart, Tasmania, Mr. Beckett is Clinical Nurse Consultant, Mental Health Program, and Mr. Holmes is Consumer Participation Officer, Alcohol and Drug and Mental Health Program, St. Vincent’s Hospital, Sydney, New South Wales, Australia. The authors have disclosed no potential conflicts of interest, financial or otherwise.